The Asia Pub Guide | Good pubs, great beer (and a few restaurants too) in Asia. Good pubs, great beer (and a few restaurants too) in Asia. 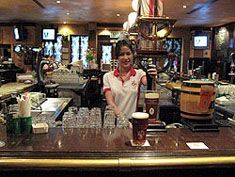 THIS PUB came about because Englishman John Stamp, a long time Bangkok resident, was yearning for a pint of best English bitter. Of course flying back to England everytime he got thirsty was inconvenient so instead he decided to fly the hops, yeast and barley to Thailand and make his own. The result was Londoner’s Pride, the only traditional English beer brewed in Thailand. And the only place to drink Londoner’s Pride is in The Londoner Pub on Sukhumvit Road. Not content with brewing his perfect pint Stamp also exported all the fixtures and fittings of a traditional English pub, a state of the art microbrewery and master brewer Peter Schwarzmueller to look after it. He installed them in the basement of UBC II Building on the corner of Soi 33. At first the Victorian exterior looks a little incongruous patched onto a modern office building but stepping through the door is like stepping into another time and place. It is only the cheerful smiles of the Thai staff that remind you that you are in Bangkok. mebeliA large rectangular bar with polished brass fittings occupies the main area. To the right is a large dining area and tucked away behind is the pool room. 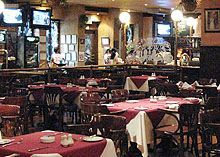 To the left as you enter is a line of booths above which there is a large blackboard with the menu on it. At the very back of the pub is a stage and the brewery itself. Pride of the brewery is, of course, the Londoner’s Pride Cream Bitter. A classic English draught bitter, and the only one brewed in Thailand. I’m not going to draw comparisons, it’s too long since I was last in England, but I will say that Londoner’s Pride is rather good. With an average alcohol content of 5.5%, and served in a proper English straight glass, it goes down very well indeed at the end of a hot day. And most days are hot. But if that doesn’t quench you thirst you might like to try a pint of the crisp London Pilsner 33. So good, they say, that a Soi was named after it. The Londoner’s team of fifteen chefs can whip up such classic dishes as roast beef & Yorkshire pudding, roast pork & crackling, fish & chips plus loads other Thai and international dishes. &lt;img src=&quot;http://www.asiapubguide.com/images/bishops_finger.jpg&quot; alt=&quot;bishops finger kentish strong ale&quot; align=&quot;left&quot; class=&quot;borderwhite&quot;/&gt;&lt;font color=&quot;#7d292e&quot;&gt;&lt;strong&gt;BISHOP’S FINGER&lt;/strong&gt;&lt;/font&gt; is special in many ways, it’s probably the only beer in Britain that’s been granted a Protective Geographic Indicator by the European Union. This means it’s the only beer that can be referred to as ‘a Kentish strong ale’. It also has it’s very own charter which decrees that: the ale must be brewed only on Fridays by the master brewer and that it must be tasted on a weekly basis by a member of the Board of Directors. Heh, I could do that job. The Charter goes on to stipulate the beer can only be brewed using water drawn from the breweries own 200-foot artesian well, winter pearl malting barley from Denne Hill Farm at Womenswold between Canterbury and Dover, and East Kent Goldings hops, grown less than 30 miles from the brewery. The wort is infused only in it’s own traditional mash tuns of Russian teak that were built in 1914. It is brewed by the Shepherd Neame in Faversham, Kent and was Introduced in 1958 to celebrate the end of post-war rationing. It was named Bishop’s Finger to emphasise the beer’s Kentish heritage. Bishops fingers were found only in Kent, they were in fact the signposts sited along the Pilgrims Way showing the route to Thomas à Becket’s shrine in Canterbury Cathedral before it was destroyed by Henry VIII in the 16th century. A SHORT while ago I made a whirlwind visit to Kuala Lumpur. While there I had planned to go over to Finnegans in Bangsa for a pint of draught Beamish but the rain was bucketing down and I had a suspicion that finding taxis would pose too much of a challenge. But all was not lost. I’d brought a couple of bottles of Archipelago’s Travellers Wheat Beer up from Singapore and I decided that the old bar in the Heritage Station Hotel, where I was staying, would be a suitable place to enjoy them. The hotel, like the railway station, began operations in 1909. Legend has it the construction was held up for ten years because the station roof didn’t comply with British saftey standards of the time. Thus, when it finally opened, just a few degrees north of the equator, it boasted a roof that could supoport the weight of a ten foot snow drift. It is a lovely building. 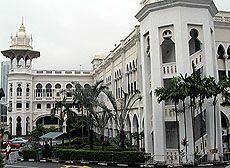 It was designed by Arthur Hubback, a government architecht, using a blend of Mughal and Moorish styles and has been an icon of Kuala Lumpur ever since. Despite being a bit run down I still enjoy staying there though I do worry about it’s future. Inside the hotel is full of athmosphere. A broad wooden staicase winds around a creaky old lift that would have been state of the art in it’s day. Long straight corridors, which give way to rooms on each side, run for the length of the station’s platforms. On the second floor the old bar room stands desserted. It’s a huge room with with a teak bar at one end. A large wooden partition separates the bar area from the corridoors. The place was unlit but there was light from the street outside and from the corridoors. I found myself a table by one of the unglazed windows and surveyed the shadows. The rain was lashing down outside bringing with it a barely perceptable breeze. The beer was perhaps not a cold as it could have been but it was good. It has a slightly flowery, hop flavour with a delicious hint of ginger. Other Asian flavours such as tamarind and lemon grass are present too but these are not as clearly defined as the ginger. A traditionally brewed beer with a tropical Asian twist. It slips down well and I wished I’d brought more than two bottles. Feeling at one with the world I slouched down in my chair and let my imagination play while the breeze played with the flags that were draped from the ceiling. I tried to visualise how the bar must have been in its heyday. I listened for the ghost of a steam train whistle below and looked for the people who would have used the bar. They would have been mining and plantation staff. 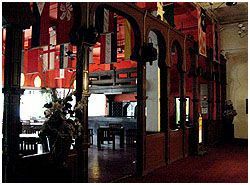 Kuala Lumpur was never on the colonial social circuit though colonial socialites would have inevitably passed through the station as they journeyed from Raffles in Singapore to the Oriental in Bangkok. The city’s old Majestic Hotel was turned into an art gallery many years ago. I know it would probably put the Station Hotel beyond my budget, I would love to see this grand old building refurbished and accorded the dignity it deserves. Which, of course, would include stocking this bar with a generous selection of fine beers. • Singapore: The Pump Room is launching their first Annual Charity Golf Tournament on Wednesday 2nd July 2008 at Keppel Club in aid of The Lupus Association Singapore. • Hong Kong: A new pub called The Wheel has opened at 26 Hollywood Road. That's almost opposite The Globe. It has six TV screens for watching sports and a small range of bottled beers including Spitfire and Old Speckled Hen. • Hong Kong: 10 May Eugene Pao plays classic rock. $288 including one free drink. This website is dedicated to life's essentials, a cozy pub, a decent pint, perhaps a little bit of music and a bite to eat.